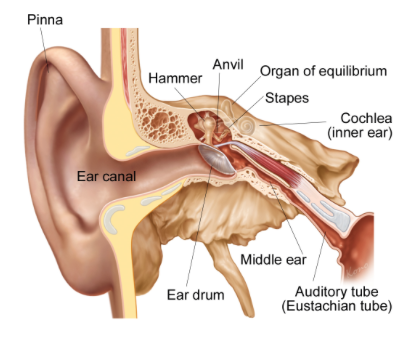 The eustachian tube is a narrow passage connecting the back of the nose and the middle ear (the air containing space behind the eardrum). Its function is to equalise the pressure on either side of the eardrum and drain any fluid or congestion from the middle ear. Equal air pressure on either side of the eardrum allows optimum hearing. Most of the time the eustachian tube is closed. During swallowing the eustachian tube opens briefly allowing air to enter the middle ear space. The air in the middle airflow space is gradually absorbed. Without a functioning eustachian tube the pressure in the middle ear will become negative. Even without a functioning eustachian tube, however, the pressure eventually stabilises through natural gas exchange between the lining of the middle ear and middle ear air. It might, therefore, be surprising to know that in 5% of the population the eustachian tube does not open normally. Most of these people have no symptoms or problems except when exposed to rapid air pressure change for example during a plane ride. A similar proportion of the population has eustachian tubes that are abnormally patent, i.e. open. This is called patulous eustachian tube. Again most people with patulous eustachian tubes have no symptoms or problems. Unrelated to eustachian tube problems, some patients with other conditions such as Ménière’s disease or superior semicircular canal dehiscence can experience symptoms often considered typical of eustachian tube problems such as fullness/pressure in the ears or hearing their own breathing/voice. Many such patients have no evidence of abnormal eustachian tube function. Dilatory eustachian tube dysfunction occurs when the eustachian tube does not open normally. The term “eustachian tube dysfunction” is often used to describe this situation. Patients experience the sensation of blockage/pressure/discomfort which may be associated with hearing loss and tinnitus. Patients are unable to improve the symptoms with the Valsalva manoeuvre (blowing into the nose against closed nostrils in an attempt to “pop” the ears). Occasionally patients can develop congestion/fluid/ear glue in the middle ear. Patulous eustachian tube occurs when the eustachian tube is not able to close normally and stays open abnormally. Patients with this condition can often hear their breathing and may hear clicking/popping noises. Abnormalities of the eustachian tube function can vary in severity. For example, after a cold many patients will have the inability to open the eustachian tube normally. With a patulous eustachian tube similarly, patient’s symptoms are not always stable. Often weight loss will exacerbate and lying down improves symptoms of patulous eustachian tubes. In my own experience, the number of patients with a sensation of blockage in the ear with accompanying normal eustachian tube function outnumbers those who have a blocked sensation and abnormal eustachian tube function. This suggests that these patients have another cause for their symptoms besides eustachian tube dysfunction. 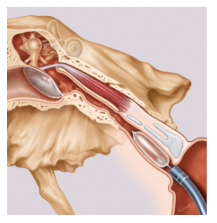 Eustachian Tube Dysfunction may act as an exacerbating factor for an underlying problem. Alternatively without a normal functioning eustachian tube patient may not be able to generate a positive middle ear pressure which could potentially help resolve symptoms due to other conditions such as Ménière’s disease. We know that the one-third of patients with Ménière’s disease improve if the middle ear pressure is increased above normal. Unfortunately, at present, there is a lack of scientific knowledge to clarify these issues. I suspect therefore there is a third state which can be labelled as “aural fullness” which may be associated with eustachian tube dysfunction as above or with other conditions such as Ménière’s disease or migraine. Some research has shown evidence that treating patients with isolated sensation of fullness in the ear with antimigraine treatments can improve their symptoms. To add further confusion to the situation patients with glue ear which would be considered a typical problem related to eustachian tube dysfunction often complain of only hearing loss without any sensation of pressure. Dilatory Eustachian tube dysfunction can occur or be exacerbated after a cold or sinusitis when the lining of the nose and the opening to the Eustachian tube at the back of the nose becomes congested/blocked. This can result in a sensation of blockage/pressure in the ear. Occasionally the congestion/infection may be particularly severe and cause fluid to build up in the middle ear behind the eardrum (glue ear). This results in a significant hearing loss. Other conditions such as allergy in the lining of the nose, nasal polyps or adenoids can also cause problems with the function of the eustachian tube. On very rare occasions potentially serious problems such as cancer or lymphomas of the back of nose can also cause congestion/fluid buildup in the middle ear. In the conditions listed above, there is usually some objective evidence of a problem (hearing loss on audiometry, negative pressure on tympanometry or an abnormal ear drum on otoscopy). The pressures behind the eardrum can be measured, and if these are abnormally negative, it would suggest that there is a problem with the Eustachian tube opening. In addition, if there is a buildup of fluid behind the eardrum (glue ear) the tympanogram test would be abnormal. Occasionally the eardrum can be pulled inwards (retraction) due to the negative pressure. This would be apparent on inspection of the eardrum. In such cases, the treatment would address the underlying cause if apparent. Conditions such as allergy and adenoids can be treated with medical or surgical intervention. Cases with nasal allergy would normally be treated with an antihistamines taken by mouth and a steroid nasal spray/drops. Adenoids are usually removed surgically. Ear balloon (e.g. Otovent®) or Earpopper® can be used in an attempt to force air up the Eustachian Tube to ventilate the ear (see video below on Otovent®). In cases where there is a buildup of fluid (glue ear) which does not resolve with medical treatment, surgery may be appropriate. Options include drainage of the fluid via a hole in the eardrum and insertion of a grommets in the eardrum. This would allow equalisation of pressure on either side of the eardrum. Grommets do occasionally cause problems such as infections or perforation of the eardrum. Grommets are also not a permanent solution. Long-term grommets can be inserted but they will also usually eventually either become blocked, infected or fall out. Recently a new device (Eustachian tube catheter) incorporating a balloon has been used to dilate the Eustachian tube dysfunction. This technique involves insertion of a catheter tube through the nose under general anaesthetic (see video below). The catheter tube is inserted into the eustachian tube opening at the back of the nose. At the end of the catheter tube is a balloon which is inflated with saline while inside the eustachian tube. This stretches the eustachian tube. In theory, there is a risk of damaging the carotid artery which takes blood to the brain. This has not been reported in thousands of cases performed in Europe. It is not a likely complication if the carotid artery is in its normal place. Other potential problems are damage to the eustachian tube or excessive dilatation of the tube resulting in a patulous eustachian tube. A patulous eustachian tube results in air entering into the middle ear easily which may result in a patient’s voice being heard excessively in the ear. Tubavent catheter inflated within cartilaginous eustachian tube. 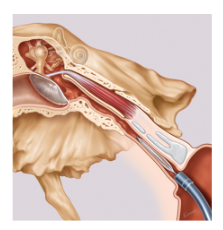 Treatment of Eustachian tube dysfunction with Tubavent Eustachian tube catheter. As mentioned above some patients have a eustachian tube that remains abnormally open. This can result in the patient hearing their voice or breathing. If not causing significant problems for the patient, Patulous Eustachian Tube does not require treatment. The video below shows an ear drum moving with quite breathing in keeping with Patulous Eustachian Tube but the patient had not problems with that ear. Occasionally if the symptoms are particularly troublesome active treatment is required. One option is saline nasal spray/douche or muscarinic antagonist nasal spray (2 puffs left and right nose 3 times a day for 4 weeks). If this is not successful a temporary injection around the opening of the eustachian tube can be carried out under local anaesthetic. If this results in significant improvement of the patient’s symptoms a more permanent treatment can be considered such as injection of a permanent filler at the eustachian tube opening or more complex surgery involving insertion of cartilage around the eustachian tube opening. I have encountered some patients who have not had what would be considered normal clicking or popping when swallowing. At some point, due to improvement in eustachian tube blockage, they start to experience normal clicking or popping when swallowing. As they have not previously experienced this clicking or popping the patient may assume that this is abnormal. If the patient is able to tolerate this, simple your reassurance may be sufficient. If not one can consider the treatments for patulous eustachian tube as above. It is apparent that besides the patients with clear evidence of Eustachian tube dysfunction there are a group of patients (possibly the majority with a blocked sensation in the ear) with symptoms of blockage in their ears in whom the eardrum, hearing and pressures behind the eardrum are all normal. Some of these patient can even equalise the pressures behind their eardrum easily by blowing into the nose without any relief from the symptoms. This group of patients may not have an actual localised problem with the Eustachian tube as traditionally thought. Many have other symptoms of discomfort, dizziness, headaches etc. The problem of blockage may, therefore, represent a type of sensitisation (similar to a chronic migraine) which is accompanied by subtle congestion of the lining of the nose, Eustachian tube and ear causing the sensation of blockage. It is known that certain types of headache/migraine can cause some congestion in the lining of the nose. It would still seem reasonable to initially treat this group of patients with antihistamines/steroid sprays etc., but the benefit is unpredictable. Grommets can also be tried, but again in my experience, the results are unpredictable with some patients benefiting while others find their problem worsens. I have performed a trial of Balloon Eustachian Tuboplasty / Dilatation. The finding of the trial has been accepted for publication in the Journal of Laryngology and Otology. I found that dilatation of the eustachian tube with a balloon catheter improves the sensation of blockage in most patient with longstanding glue ear but glue ear and retractions of the eardrum often persisted. The sensation of the blockage and glue ear may, therefore, represent two separate problems which can exacerbate each other. If patients do have symptoms suggestive of a migraine type of problem it would be reasonable to try migraine treatments (click here).